Toshiba Bluetooth Stack (Bluetooth Utility) is suitable for TOSHIBA Bluetooth adapter. 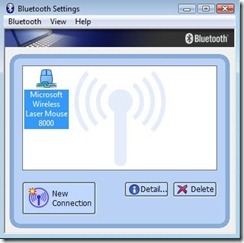 The Bluetooth Utility is a software tool used to configure a variety of settings once a connection has been established between the PC and the Bluetooth wireless technology device. It also facilitates the exchange of files between devices having onboard Bluetooth wireless technology. The Bluetooth Utility comprises the following six tools. Descriptions are provided for the functions and the supported profiles for the respective tools. Thank you so much for restoring my palmtop.